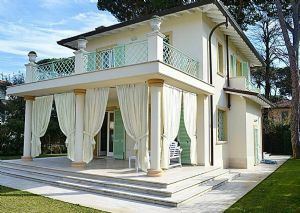 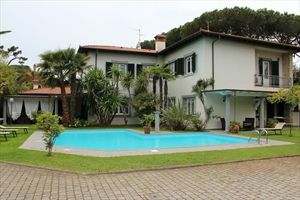 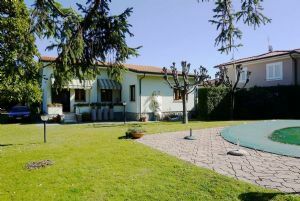 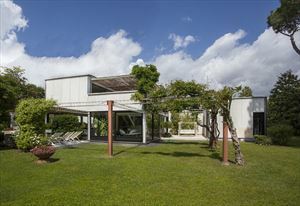 A detached villa (160 m2) with a well-kept garden (900 m2) located in the central area of ​​Forte dei Marmi about 900 meters from the sea. 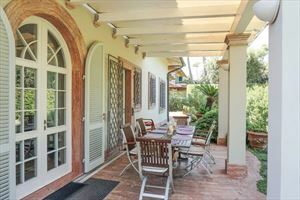 The ground floor consists of a spacious terrace with outdoor furniture, hallway, living room with dining table and access to the terrace, single bedroom, bathroom with shower, kitchen with dining area and an independent exit to the garden. 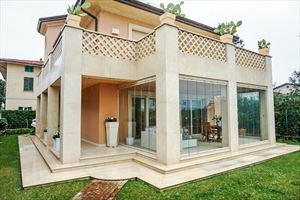 Upstairs are two bedrooms with queen beds, one of them with a balcony; two double bedrooms with balconies and two bathrooms, one with bath, the other one with shower. 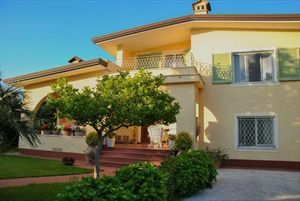 The villa is equipped with alarm system, air conditioning, Wi-Fi, satellite TV, safe, automatic gate, barbecue and parking in the garden.